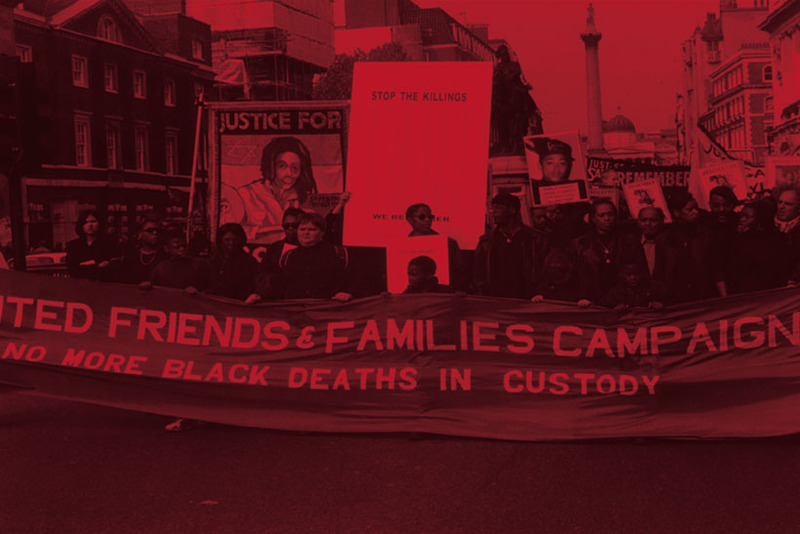 Between 1969 and 1999 over one thousand people died in police custody in England. No police officer to date has ever been convicted for any of these deaths. The deaths continue and so does the cover-up. Injustice is the story of the struggles for justice by the families of some those killed by the police.
" All 300 places in the hall were full, with a dozen or so people having to sit in the aisles. No-one moved during the whole film. People were bewitched. There were all sorts of people: those who have lost someone in custody, or themselves been brutalized; political activists; young people from the areas that suffer most from police abuses; human rights activists of the more 'a-political' bent; an ex chief-justice; a few journalists; young women in the women's movement; a few academics; a group of women who had organised a mini-bus and told their husbands they were going to a meeting about housing problems (in case the idea of cinema met with husbands' refusal). So, we started with the four short speeches. One by me, then one by Rajni for the Women's Liberation Movement, then the widow of Kaya (the famous musician killed in police custody)Š..Then there was the film. You couldn't hear a sound. Even the children in the audience were still. And the babies didn't cry. " The powerful screening in Mauritius was one of hundreds that have taken place since the film was launched. But Injustice is a film that nearly did not make it to the cinema screens. On the 6th July 2001 the premier opening of Injustice at the Metro Cinema in London was halted dramatically when two police officers issued last minute legal threats to the cinema owners. News spread about the police action and the ensuing uproar in the cinema. Journalists and television crews from the UK, Iran and Japan were present. So were diplomats from an number of countries. An hour later we were condemning the police action on the BBC Evening News, with a simple message - we would not let the police kill our film. We had experienced enormous difficulties in making Injustice; with no support from the cinema industry or television. During the production we had made solemn promises to our selves, to the families of the dead and even to the dead themselves that we would not let the film be buried. Five days later, on the 11th July a second attempt to show the film at Conway Hall, a place renowned for supporting freedom speech, was met by more sabre rattling from the police. The number of police officers who felt aggrieved by the film had increased to thirteen. After it became clear that the manger of Conway Hall was going to cancel the screening a cry from the audience rang out - "Show the film". The audience took control of the venue; barricaded the doors and projected the film themselves. This action catapulted the story of the attempts to censor the film into the daily newspapers. For some time following this screening, the police continued to harass venues that tried to show the film. Publicity increased with every attempt that they made. What the film did was to put a heart and soul to the shocking figure of 1000 deaths through following the struggles for justice of a few families. It was this struggle that the police wanted to silence. Throughout the summer of 2001 Injustice was screened anywhere and every where we could. The threats of libel to the various cinemas kept coming and a whirlwind of late night conferences, telephone calls and meetings ended with apologies by cinema managers (the staff where always keen to support us) and promises of a screening "once the legal problems had cleared". We made sure that there was always a venue nearby the cinema ready to show the film at short notice that same evening whether it was a squatted anti-globalization cafe in Manchester a pub in Hoxton, a community hall in Tottenham. Throughout this period the families of those killed by the police stood by our side With them we travelled the country showing the film and talking about the struggle for justice. At every screening there was an outpouring of grief and anger from the audience and also a determination to keep showing the film and supporting the struggle of the families. Screenings were always full spilling on to the street, Q&A sessions would go on long afterwards. In this fight we were helped by many people - workers, students, lecturers, trade unionists, religious leaders, anarchists. Every screening was fought for and many won only because of the support of these people. Injustice began to mobilize people to take a stand against police oppression. Every screening led to other invitations to show the film ­ like at the Fire Brigades Union conference in Sheffield, at a documentary film Festival in Norway. The threats by the police officers continued. We showed Injustice to eight police officers who had been involved in the deaths featured in the film and at then wrote to them and made it clear that we would go to court to defend the film. If they went forward with a libel trial they would have to stand in court on account. We have not heard from them since. Injustice is a film about human rights abuses perpetuated by serving police officers who had denied their victims the right to life. The police claimed that the film accused them of being murderers when they had not been convicted of being so. Of course the heart of the film is that no police officers has been convicted for these deaths because the state in all its parts - the police self investigation, the Police Complaints Authority, the Crown Prosecution Service, the judiciary, government ministers - have made sure they are not prosecuted. "The Police Federation wishes to respond to the screening of the film Injustice and the subsequent adverse publicity received by the Federation for simply acting in the best interest of its members. The considerable pre-screening publicity for Injustice, mentioned various incidents ŠŠ. This left the officers with no option other than to draw to the attention of any cinema planning to show the film the potentially defamatory material contained within it and the possible legal consequences of publishing that material. Ultimately, a number of the officers who believed they might be referred to in the film, were given the opportunity to view the film. " On the same day, 23rd August 2001, the United Families & Friends Campaign held a picket of the London offices of Russell, Jones & Walker the solicitors firm that was harassing cinemas on behalf of the police. The protest was an unprecedented move and highlighted the fact that the same firm that has been specializing in defending police officers in all the most controversial cases was also the same one threatening us. The Police Federation demanded that we make cuts to the film. We refused because we would not censor the voices of the families and we were also defending the artistic integrity of the film. The Federation went silent. At the Black Filmmakers International Film Festival, in London on the 10th September 2001 the Curzon Cinema agreed to go ahead with a public screening. Tension was high as the cinema waited for the usual police threat. It never came. The film went on and a packed cinema audience were shocked and angered as the film unfolded before them. Following the screening there was a huge roar and standing ovation as we took to the stage with the families. The curse of the Police Federation was finally broken. Immediately after the screening Injustice was invited to film festivals in New York and Jamaica. By September 2001 Injustice began to be shown in many renowned Film Festivals including Sheffield Documentary where it played to packed audiences. At every screening the families of the deceased were present and impressed audiences with their courage and determination. Throughout 2001 and beyond the range of audiences has been immense. We have shown Injustice in a disused bus garage in Liverpool to three hundred white working class people and as the film flickered on the screen we saw tears falling from their eyes. We have shown Injustice in a community centre in Brixton to hundreds of young black people where the screening was preceded by libations to the spirits of the dead and where African elders cried deep into the cold winter night at the loss of their children. The film has driven many to tears and anger and spurred others into action. Help has come from establishment judges and from militant revolutionaries. Throughout the fight we had had immense support from the families; others such as David Price Solicitors and the organization Index On Censorship have supported us constantly. The police had gone quite and we approached a number of cinemas to see if they would give the film a run. On 2nd December 2001 the film began its West End run at the Prince Charles Cinema in Leicester Square London. This was the confirmation that the police tactics had failed and that the film could now be seen by the cinema going public. Injustice was also a real achievement in British cinema and was breaking new ground as an independently made feature length documentary film to have a theatrical release. It ran at the Prince Charles for a couple of months. National screenings of the film have continued through the British Film Institute. Since then the film has gone from strength to strength. Over two hundred screenings have taken place at which we and the families were present. There have been some powerful moments. Each screening has its own dynamics, reactions and responses. At the African Diaspora Film Festival in New York the audience included families of young men and women that had been shot by the NYPD including Nicholas Heyward JR, Malcolm C. Ferguson, Frankie Arzuaga and Anibal Carrasquillo as well as the mother of Amadou Diallo who died after being shot 41 times by two police officers. Despite the horrors perpetuated by the NYPD those mother and fathers were shocked at the level of violence that had been used to kill the people featured in Injustice who were not slain by bullets but by the batons and fists of the Metropolitan Police. Similarities emerged - the police self investigation a corrupt judicial system and political administrations willing to allow those who kill to be our 'protectors'. The outpourings of grief as families from the UK and the US met was immense as was the determination to work together, it¹s a hard task faced with the onslaught of police violence exploding in both societies. The New York screening acted as a catalyst to bring families together. Another followed in South Central LA organised by the New Panther Vanguard Movement on the 10th anniversary of the beating of Rodney King by the LAPD. We showed the film in a school auditorium on a hot summers day to an audience which included activists, school children, and families who had suffered a loss . In an electric and emotional tribute Brian Smith who had lost a brother in police custody in downtown LA handed a number of pledge's for each of the people featured in the film to Brenda Weinberg and Myrna Simpson which read "We pledge that the life and humanity of Brian Douglas will not be forgotten. We pledge that his highest hopes and aspirations will live on in us, and that we will seek justice for his and all of the Stolen Lives. In this way we pledge that their memory will stay alive in us and will inspire us to fight for justice and a better world"
During these USA trips important links were developed with the New Panther Vangaurd Movement, the October 22nd Coalition and the Haitian Coalition for Justice creating a framework for international action by the families of those who have died in police custody. Back in the UK the film was continuing to have an impact. Injustice briefly mentions the death of Christopher Alder who died in Hull Police Station on the 1st April 1998. Despite an Inquest jury of unlawful killing their had been no charges against the officers involved. As a result of the publicity of the film one of the main witnesses in the case came forward and approached Janet Alder, Christopher's sister who had been tirelessly campaigning for prosecutions of the police. The witness, who was a medical expert, was shocked to learn that the officers had not been charged and fresh efforts were made based on her evidence and another expert witness. As a result the Crown Prosecution Service were later forced to charge five officers with Manslaughter in the case of Christopher Alder. The controversy around Injustice had regenerated interest in all the cases in the film. Many who watched Injustice were incredulous at the sheer inhumanity of the cases and the inexcusable lack of justice and were asking why the police officers that had committed these killings were not prosecuted. We had made this very clear in a press release that we put out regarding the role of the Crown Prosecution Service which read: "Within the film the CPS is accused of collusion and in the covering up the deaths of a number of people at the hands of the police. Despite overwhelming evidence against police officers the CPS has consistently refused to prosecute. The families believe that, rather than basing their decisions on evidence, the CPS have made political decisions not to prosecute the officers involved and that their relatives have not had the justice they deserve. In the very few prosecutions that do take place the CPS have not been vigorous and have mounted very poor prosecutions." The Government had to be seen to be doing something and responded in December 2001 when the Attorney General announced in Parliament a review of the decision making process of the Crown Prosecution Services Role in death in custody cases. In a private screening of the film the Attorney General Lord Goldsmith was challenged to meet with the families. As time progressed it became clear that the Government was unwilling to reopen the cases featured within Injustice. Without such a commitment from the Attorney General then the review will become another attempt to silence the families whose cries for justice are the only reason that this process has been instigated. Later in 2002 the Attorney General attended a public screening of the film at the Prince Charles Cinema, it was a fully charged and vocal screening and at the Q&A session which followed the audience made it very clear to Lord Goldsmith that their support was firmly behind the families and that they would except nothing but justice. The political impact of the film also extended to the European Parliament where in the Spring of 2002 Jean Lambert MEP hosted a screening in Parliament. The Green Party committed themselves to raising the issue featured in the film at further parliamentary sessions and put out the following statement: "As the European Union moves ever closer to forming 'an area of freedom, security and justice', as police and judicial co-operation increases, and as proposals for a European Arrest Warrant are adopted, it is crucial that we look more closely at the behaviour of European police forces. Respect for the rights of all citizens and non-citizens as enshrined in the European Convention on Human Rights must be guaranteed in all policing activities. It is clear that at present, this is not always the case." The international tour of the film also continued. For example, At the Gothenburg Film Festival, Sweden we had three packed screenings and met the family of Hannes Westberg a young protestor who had been shot by police during the anti-globalization protests in Gothenburg the previous summer. Police violence was a new phenomena and many people had been shocked by the brutality lashed out on the protestors. In Pakistan, the Human Rights Commission organised a screening in Lahore. The audience was aghast, the film was not the image of the British Booby - kind to old ladies and helpful to tourists - that they had been fed. On the 1st February 2002 in Derry, Northern Ireland we showed the film to the families of the 13 people shot by British Paratroopers killed on Bloody Sunday and then marched with them on the anniversary next day together with another 30,000 who took to the streets of Derry. On a tour of Tehran we showed the film to students, journalists and trade unionists and met up with senior government figures. After being condemned and vilified by the West for human right abuses they were keen to learn about the stories featured in Injustice. We went on several television and radio programmes including the main evening news, discussion programmes and cultural shows and got the basic message across that their were human rights abuses in the UK, that the government was condoning the killings by the police and that there had been attempts to censor us. We also reiterated that the core of the film was the importance of organising and that the story was about a group of women who had come together to achieve justice. In Iran these broadcasts were watched by audience of over 30 million and it¹s a message we have carried all over the world. In spite of the enormous success of the film and the fact that the Police Federation has backed off from any confrontation with us and the cinemas or organisation screening the film, UK broadcasters have refused to show the film. Channel 4 have claimed that Injustice "raises important issues but could not be broadcast without the serious risk of attracting a number of indefensible libel actions from police officers." On the 30th April 2002 and then 1stMay 2003 the film was projected onto the side of the Channel Four building in London as a protest to their censorship and a group was formed which vowed to return every year. It is a matter of public interest that the film is broadcast in the UK. Injustice continues to play at prestigious film Festivals including Fajr, Rotterdam and Durban. Screenings in the UK continue in cinemas, colleges and community centres. Every screening brings more publicity for the cases. Injustice has been critically acclaimed but unlike other films its aim is not about mobilizing money and awards but people. The social movement that has been generated by the film is evidence of the power of cinema. Change can come through collective determination and as film makers we have tried to play a part in that. This feeling is reflected towards the end of the film by Myrna Simpson whose daughter Joy Gardner died in police custody 28th of July 1993 "It's important for people to fight for justice and don't stop because there is no other way to get justice but to fight for it, and I am still fighting for justice for Joy and not only for Joy, as I say always but for all. I am fighting for justice for everyone that has been unjustly killed."